Bua Thong waterfalls or Buatong, or also known as the Sticky Waterfalls, is an amazing day trip about an hour outside of Chiang Mai. Why Bua Thong waterfalls is special ? 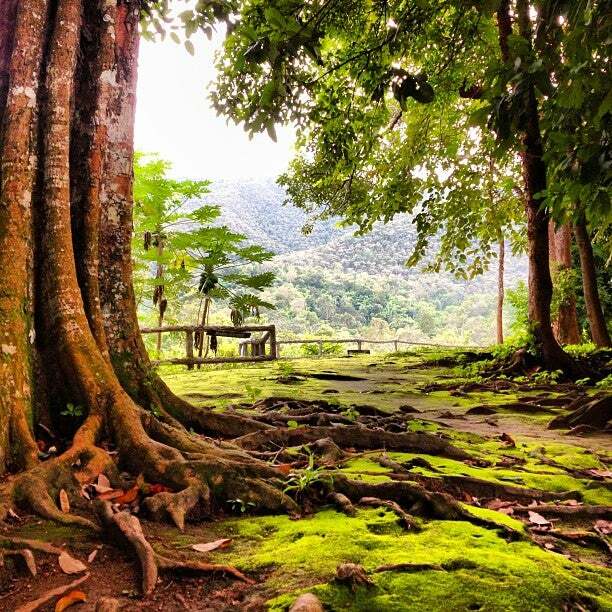 Bua Thong is one of the most unique places in Thailand. Located about an hour and a half drive north of Chiang Mai’s Old City, these waterfalls are not only impressive and gorgeous, but a special feature allows you to climb directly up the rocks into the oncoming cascading water! 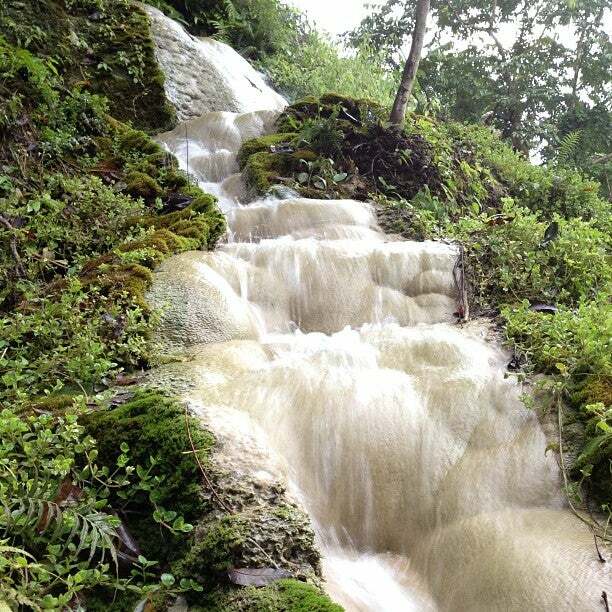 The Bua Tong Waterfall is actually a series of horsetail falls (water flowing over rocks without cascading or abruptly dropping) that cut through the jungle landscape, but what makes them unique is that they flow over tiers of porous limestone. Water is constantly rushing over the limestone, but the surface of the limestone has an almost sticky feel that creates great traction with skin. As a result, you can walk down the falls as if there were no water at all. What to explore at Bua Thong waterfalls? The Sticky Waterfalls get their name from a mineral deposit that provides an incredibly grippy surface for bare feet and hands. In fact, the rocks feel like hardened sponges, callous and even slightly prickly to the touch, but surprisingly give a bit under pressure. There are also no algae or slime that adheres to the rocks, leaving a perfect canvas to climb up the waterfall. It is impressively steep in some places, but with the aid of the limestone deposits on the stones, we felt like Spider-Man! From the top of the waterfall you can admire the mountains and the jungle. You can also do what the locals do and have a picnic. The small pool on the left that you see in the picture below is absolutely safe for the kids to have a splash. How to get to Bua Thong waterfalls? It takes about an hour drive from the city center of Chiang Mai to get to sticky waterfalls and directions are pretty straight forward. Drive on the superhighway towards the Central Festival Mall in Chiang Mai and take the exit up the 1001 highway towards Phrao. You'll drive past Mae Jo University and keep heading north, ignoring the random 1001 turn off that goes south east. Just go straight past Mae Jo University and keep driving north. Thanks to the lime stone, which floats in the water, the rocks are not slippery and you can climb them easily without any equipment. You don’t even need shoes! There are no places to swim, but you can cool off by just sitting in one of the small ‘pools’ at the bottom of the waterfall. It is better not to walk around the paddles in your flip flops as you can easily lose them in the mud. When you are at the top look for a sign to NamPhu Chet Si. 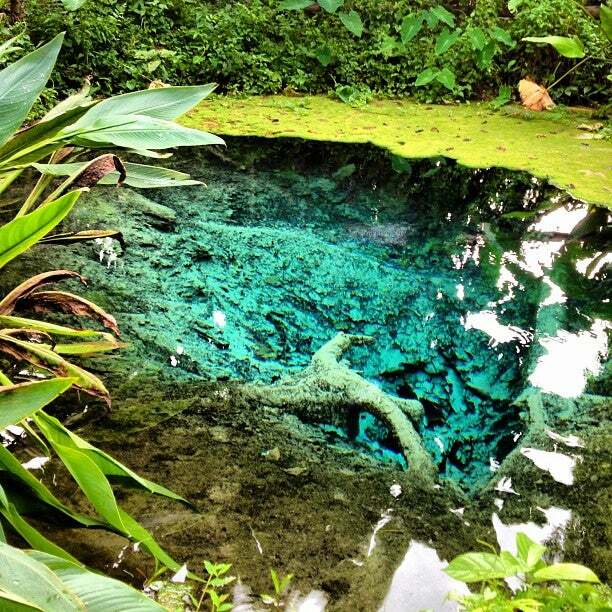 It is a small shrine and a sacred spring, hidden in the jungle. There are 5 levels and each of them is a great place to sit down and enjoy your surroundings. The entrance fee is free! However there is a small donation box near the entrance. There is also a 1,500 baht (~$42US) fine for bringing in food and drinks as they are trying to prevent litter. Rad place to go and get out the city for half a day. Getting there: Hotel told us a private car to take us would be $3000tbh, walked out side and jumped in a red ute taxi for $1000tbh return and the driver waited till we wanted to leave. It's a hour+ drive and we had a pretty loose driver (100km/h+ passing cars on narrow roads in a tippy ute with no back). If your chill and not worried about a sketchy ride it's sweet, missus wasn't a fan of it so would say if you have kids or you like to feel safe then maybe pay a little more and take a private car, keep the red ute experience to round town where you wind go over 50km/h. There is no fees when you get there so the ride is the only cost. The falls itself: The falls are great, easy to walk up and a nice temp to hang out in on a hot day, no need for water shoes bare feet is sweet, just take togs, a camera and insect repellent. It's pretty off the grid so when we went there was only 3 other groups in the area, you can quickly find a spot to yourself to relax in. There is a small snack hut out there if you forget food/ water also. Would definitely recommend the trip out to visit, relaxing spot to cool down in.